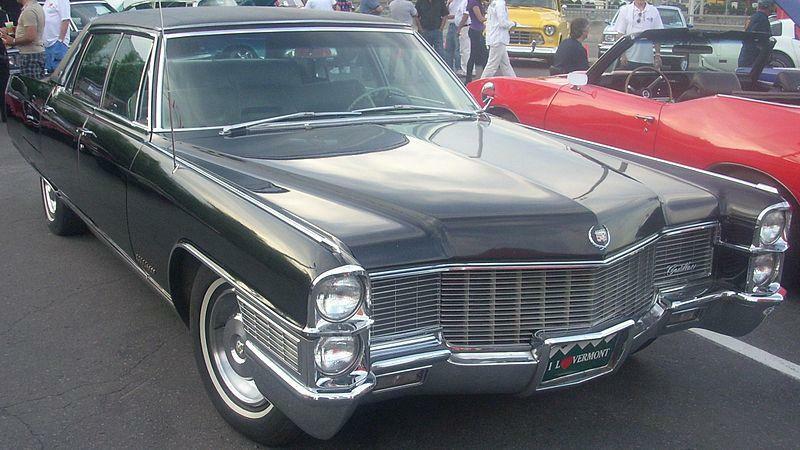 The 1965 Cadillacs featured all-new styling with dual vertical headlamps, which were very much in vogue. For the first time since 1958, the Series Sixty Special had its own specific body, on an extended 133-inch wheelbase. Eschewing the old X-braced frame for a new perimeter frame also gave the car more interior room. The bodies were advertised as being “by Fleetwood”, but in reality the cars were simply extended GM C-body vehicles. The only body style was the four-door hardtop sedan. A rather astounding 18,100 were built, coming within 310 vehicles of actually outselling the entire Imperial line by Chrysler. Prices started at $6,479, about $1,500 above the least expensive Cadillac Calais four-door. The engine was carried over from Cadillac’s new-for-1964 V-8, which displaced 429 cubic inches and put out 340 hp. The transmission was also carried over from the all-new-for 1964 Turbo-Hydramatic 400 automatic transmission. The 1966 line was expanded with the addition of an even more upcale Fleetwood Brougham. The new sub-series outsold the base car by 13,630 to 5,455, and pricing started at $6,695 and $6,378, respectively. This made the 1966 Sixty Special quite the bargain, since it was actually a $101 price reduction from 1965. The 1967 cars had new styling, retaining the still fashionable vertical headlamps. Once again, the Sixty Special Fleetwood Brougham outsold the Sixty Special. The 1968 cars carried over much of the 1967 styling, with the addition of a longer hood and hidden headlamps. Under the hood, however, the big (though admirably light) Cadillac V-8 was bored and stroked to a full 472 cubic inches, for 375 hp. Every Cadillac owner now could get to the golf course or Country Club that much faster. A new 60/40 split bench seat was standard on the more luxurious Sixty Special Fleetwood Brougham, which saw sales increase while the Sixty Special sales dropped again. Clearly, most Cadillac buyers were willing to spend a little extra for the Fleetwood Brougham features. The 1969 cars were entirely restyled in front, with horizontal dual headlights and no more vent wings on the front doors. For 1970, the cars were only lightly facelifted with a new grille and taillamps. In fact, 1970 was the last year for the plain (if they could ever be considered that!) Sixty Special, which only sold 1,738 units versus 16,913 Sixty Special Fleetwood Brougham cars. Today, these cars make for a sublime driving and riding experience for what is really no more outlay than a modern blob-mobile family car.